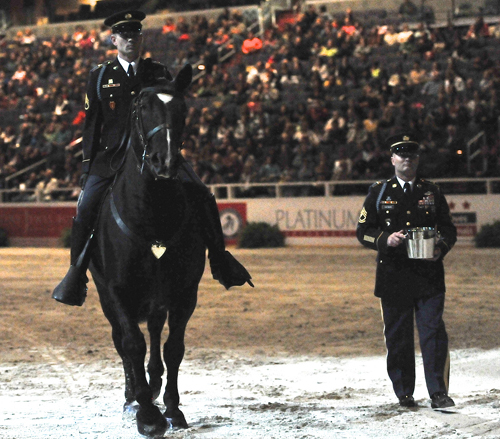 Washington, Oct. 23, 2014 - The Washington International Horse Show (WIHS) is pleased to announce that it will host its fourth annual Military Night presented by The Boeing Company on Friday, October 24. This special evening honors the nation's armed forces in the heart of downtown Washington D.C. In its 56th year, the WIHS will host six days of hunter, jumper, and equitation competition at Verizon Center on October 21-26. "Boeing is proud to partner with the Washington International Horse Show to give back to members of our military and their families," said Tim Keating, Senior Vice President, The Boeing Company. "We have a strong commitment to our men and women in uniform, along with their families, and are happy to support WIHS in providing them an opportunity for a fun night of equestrian sport." Power and speed is the theme for Military Night 2014, which will include an exciting evening of competition, a trophy in honor of the Armed Forces, recognition and support for the WIHS Official Military Charity Partner, Tragedy Assistance Program for Survivors (TAPS) and a reception to benefit local therapeutic riding centers serving the military community. The Boeing Company Puissance in 2013. Shawn McMillen Photography. Since its 1958 debut, WIHS has been a Washington, D.C. institution attended by countless horse enthusiasts of all ages, as well as presidents, first ladies, celebrities and military and business leaders. WIHS has enjoyed a close relationship with the United States military since the earliest days of the horse show when former U.S. Army horses and riders represented the country in national and international competition. WIHS is proud to continue the connection between the equestrian community and the military. In 2009 WIHS initiated its Armed Forces Program when it first partnered with the U.S. Army Caisson Platoon. Part of the "The Old Guard" from Fort Myer that serves Arlington National Cemetery, the Caisson Platoon also carries out an equine therapy program. The same dutiful horses that pull the caisson for the burial of fallen service members also help rehabilitate wounded warriors by improving their physical well-being and morale. Since then, the program has continued to grow each year. Bridget Love Meehan, Executive Director of WIHS, stated, "We are very pleased to welcome The Boeing Company back to as a significant partner and sponsor of our new $15,000 Leading International Rider Award. Boeing has a vision of people working together, and they are a large part of the activities and opportunities we have at Military Night. We are proud to be partners with them." 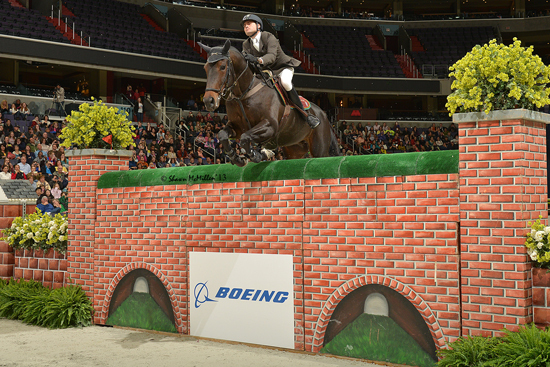 One of two featured events is The Boeing Company $25,000 Puissance high jump competition. The Puissance is a fan favorite at WIHS as spectators watch the incredible power and athletic ability of horse and rider attempting to clear a wall set at record heights. The indoor Puissance record was set at WIHS more than 30 years by Anthony D'Ambrosio riding Sweet'N Low, when the pair jumped 7 feet 7½ inches to win the competition in 1983. The $50,000 International Jumper Speed Final will include an exciting new element this year - The "Jump for TAPS" Challenge presented by T. Boone Pickens to benefit WIHS's Official Military Charity, the Tragedy Assistance Program for Survivors. Each time a rider clears the TAPS jump, Pickens will donate $1,000 to TAPS, and if all the riders clear the TAPS jump, he will make an additional $5,000 donation. A Celebrity Barrel Racing Exhibition, presented by Washington Area Chevy Dealers, will feature an Army vs. Navy theme this year in honor of Military Night. Professional barrel racers affiliated with the National Barrel Horse Association, Women's Professional Rodeo Association or American Professional Rodeo Association will team up with a celebrity rider to run the barrels. Also during the evening's competition, The Armed Forces Reception presented by The Travelers Companies, Inc. will be held in the Acela Club overlooking the action in the ring. Special guests and dignitaries will join attendees to celebrate our nation's service members and proceeds will benefit six local therapeutic riding centers with programs for wounded warriors: Caisson Platoon Equine Assisted Program, Northern Virginia Therapeutic Riding Program, Loudoun Therapeutic Riding, Rainbow Therapeutic Riding Center, Maryland Therapeutic Riding, and Therapeutic Recreational and Riding Center. Tickets are $150 and available at www.wihs.org or by calling 202-525-3679. Through its popular Military Ticket Program, presented by Fidelity Investments, WIHS offers the dedicated men and women who serve our country and their families an opportunity to experience an exciting evening of international show jumping and equestrian entertainment at no charge. WIHS thanks Fidelity Investments, The Boeing Company, The Travelers Companies, Inc., Jacqueline B. Mars, Waldron Wealth Management, Helen K. Groves, Base Directory and Military One Click for their generous support of this program. Since 2010 more than 15,000 ticket vouchers have been donated to the military and their families. Klinger, the beloved Caisson Platoon horse and TAPS ambassador, will be at WIHS on Military Night to award the second annual Klinger Perpetual Award for Honor and Service presented by Ariat International and EQUUS Foundation. This year will mark the second presentation of The Klinger Perpetual Award for Honor and Service presented by Ariat International and EQUUS Foundation. Named for Klinger, the beloved Caisson Platoon horse and TAPS ambassador, the award recognizes a horse, individual or organization that best demonstrates the values of honor and service as embodied by Klinger, who will be on hand for the award presentation. The 2014 award winner will have the opportunity to designate a $1,000 grant from the EQUUS Foundation to a charity within the EQUUS Foundation Equine Network, and Ariat International is donating a pair of boots to the winner. Friday night's festivities will also include a Mounted Color Guard organized by the Maryland National Capital Park Police, the national anthem performed by Rebecca Morrison, a TAPS staff member and surviving spouse of Army Captain Ian Morrison, and a patriotic performance by the Old Guard Fife and Drum Corps from the 3rd U.S. Infantry Regiment dressed in uniforms patterned after those worn by the musicians of General George Washington's Continental Army. The Washington International Horse Show looks forward to hosting world-class competition, entertaining exhibitions and wonderful community activities, as well as a silent auction and fabulous shopping with more than 50 specialty boutiques during its 2014 event. For more information, please visit www.wihs.org, join us on Facebook, and follow us on Twitter and Instagram.